Little piece of art in your garden, made by reusing unwanted tableware, hand painted by an illustrator Zuzia Turek. Choose between three unique pieces. 'Me To You' birdfeeder was designed for those who love watching birds. And who doesn't? 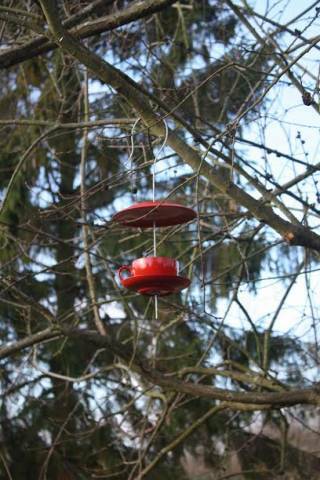 The intense colour of the feeder will attract many types of birds who will visit your backyard for everyday lunch. Not only classy, health of our little friends was considered as well! Typical problem with standard birdfeeders is that they are not getting cleaned very often. Seeds get wet, they go off and they can actually spread infections among garden birds. 'Me To You' was designed thinking about ease of dismantling it. By undoing wingnuts you can take it apart and wash it's three elements properly under running water. Tighten the elements back on the stainless steel rod, and 'Me To You' is back, ready to use! By fitting elements in certain distances from each other, you define what size birds will have an access to the seeds. Please bear in mind that the top plate is meant to cover seeds from rain.